The Coptic Church or the Church of Alexandria is called “The See of St. Mark”; one of the earliest of four sees: Jerusalem, Antioch, Alexandria, and Rome. The Copts are proud of the apostolicity of their Church, whose founder is St. Mark; one of the seventy Apostles (Mk 10:10), and one of the four Evangelists. He is regarded by the Coptic hierarchy as the first of their unbroken 117 patriarchs, and also the first of a stream of Egyptian martyrs. This apostolicity was not only furnished on grounds of its foundation but rather by the persistence of the Church in observing the same faith received by the Apostle and his successors, the Holy Fathers. 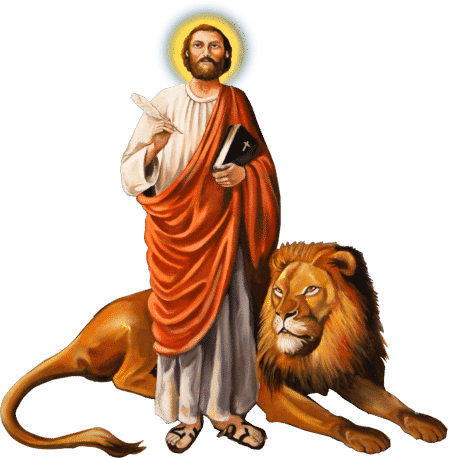 St. Mark was an African native of Jewish parents who belonged to the Levites’ tribe. His family lived in Cyrenaica until they were attacked by some barbarians, and lost their property. Consequently, they moved to Jerusalem with their child John Mark (Acts 12:12, 25; 15:37). Apparently, he was given a good education and became conversant in both Greek and Latin in addition to Hebrew. His family was highly religious and in close relationship with the Lord Jesus Christ. His cousin was St. Barnabas and his father’s cousin was St. Peter. His mother, Mary, played an important part in the early days of the Church in Jerusalem. Her upper room became the first Christian church in the world where the Lord Jesus Christ Himself instituted the Holy Eucharist (Mk 14:12-26). Also, this is the same place where the Lord appeared to the disciples after His resurrection and His Holy Spirit came upon them. Young Mark was always associated with the Lord, who choose him as one of the seventy. He is mentioned in the Holy Scriptures in a number of events related with the Lord. For example, he was present at the wedding of Cana of Galilee, and was the man who had been carrying the jar when the two disciples went to prepare a place for the celebration of the Passover (Mk 14:13-14; Lk 22:11). He begins his Holy Gospel by describing John the Baptist as a lion roaring in the desert (Mk 1:3). Once a lion and lioness appeared to John Mark and his father Arostalis while they were traveling in Jordan. The father was very scared and begged his son to escape, while he awaited his fate. John Mark assured his father that Jesus Christ would save them and began to pray. The two beasts fell dead and as a result of this miracle, the father believed in Christ. At first, St. Mark accompanied St. Peter on his missionary journeys inside Jerusalem and Judea. Then he accompanied St. Paul and St. Barnabas on their first missionary journey to Antioch, Cyprus and Asia Minor, but for some reason or another he left them and returned home (Acts 13:13). On their second trip, St. Paul refused to take him along because he left them on the previous mission; for this reason St. Barnabas was separated from St. Paul and went to Cyprus with his cousin St. Mark (Acts 15:36-41). There, he departed in the Lord and St. Mark buried him. Afterwards, St. Paul needed St. Mark with him and they both preached in Colosse (Col 4:10), Rome (Phil 24; 2 Tim 4:11) and perhaps in Venice. St. Mark’s real labor lays in Africa. He left Rome to Pentapolis, where he was born. After planting the seeds of faith and performing many miracles he traveled to Egypt, through the Oasis, the desert of Libya, Upper Egypt and then entered Alexandria from its eastern gate in 61 A.D.
On his arrival, the strap of his sandal was loose. He went to a cobbler to mend it. When the cobbler – Anianos – took an awl to work on it, he accidentally pierced his hand and cried aloud “O One God”. At this utterance, St. Mark rejoiced and after miraculously healing the man’s wound, took courage and began to preach to the hungry ears of his convert. The spark was ignited and Anianos took the Apostle home with him. He and his family were baptized, and many others followed. The spread of Christianity must have been quite remarkable because pagans were furious and ought St. Mark everywhere. Smelling the danger, the Apostle ordained a bishop (Anianos), three priests and seven deacons to look after the congregation if anything befell him. He left Alexandria to Berce, then to Rome, where he met St. Peter and St. Paul and remained there until their martyrdom in 64 A.D. Upon returning to Alexandria in 65 AD, St. Mark found his people firm in faith and thus decided to visit Pentapolis. There, he spent two years preaching and performing miracles, ordaining bishops and priests, and winning more converts. Finally he returned to Alexandria and was overjoyed to find that Christians had multiplied so much that they were able to build a considerable church in the suburban district of Baucalis. In the year 68 AD, Easter fell on the same day as the Serapis feast. The furious heathen mob had gathered in the Serapis temple at Alexandria and then descended on the Christians who were celebrating the Glorous Resurrection at Baucalis. St. Mark was seized, dragged with a rope through the main streets of the city. Crowds were shouting “The ox must be led to Baucalis,” a precipitous place full of rock where they fed the oxen that were used in the sacrifice to idols. At nightfall the saint was thrown into prison, where he was cheered by the vision of an angel, strengthening him saying, “Now your hour has come O Mark, the good minister, to receive your recompense. Be encouraged, for your name has been written in the book of life.” When the angel disappeared, St. Mark thanked God for sending His angel to him. Suddenly, the Savior Himself appeared and said to him, “Peace be to you Mark, my disciple and evangelist!” St. Mark started to shout, “O My Lord Jesus” but the vision disappeared. On the following morning probably during the triumphal procession of Serapis he was again dragged around the city till death. His bloody flesh was torn, and it was their intention to cremate his remains, but the wind blew and the rain fell in torrents and the populaces disperse. Christians stole his body and secretly buried him in a grave that they had engraved on a rock under the altar of the church. Preaching in Egypt, Pentapolis, Judea, Asia Minor, and Italy during which time he ordained bishops, priests, and deacons. Establishing the “School of Alexandria” which defended Christianity against philosophical school of Alexandria and conceived a large number of great Fathers. Writing the Divine Liturgy of the Holy Eucharist which was modified later by St. Cyril to the Divine Liturgy known today as the Divine Liturgy of St. Cyril. When your mind does wander during prayer, bring it back. When it wanders again, bring it back again. Each and every time that you read a prayer while your thoughts are wandering (and consequently you read it without attention and feeling,) then do not fail to read it again. Even if your mind wanders several times in the same place, read it again and again until you read it all the way through with understanding and feeling. In this way, you will overcome this difficulty so that the next time, perhaps, it will not come up again, or if it does return, it will be weaker. This is how one must act when the mind wanders.